Dr Fortuno is a series of casino games consisted of a classic video slot machine and blackjack game produced by Yggdrasil. Clearly, our focus in on the 5-reeler with 3 rows and 20 fixed paylines set in the scenery of the magician’s show in a steampunk theatre. The mysterious lord of magic performs with his crew of misfits offering quite a gaming experience with the Nudging Wilds and rewarding “Wheel of Fortuno”. Given the number of reels and rows, your main task would be to collect 3 or more symbols of the same kind placed on adjacent reels from the leftmost. The paytable is clearly crowded with themed symbols, each with a different payout rating including magical potions of different sorts, abilities, and powers. 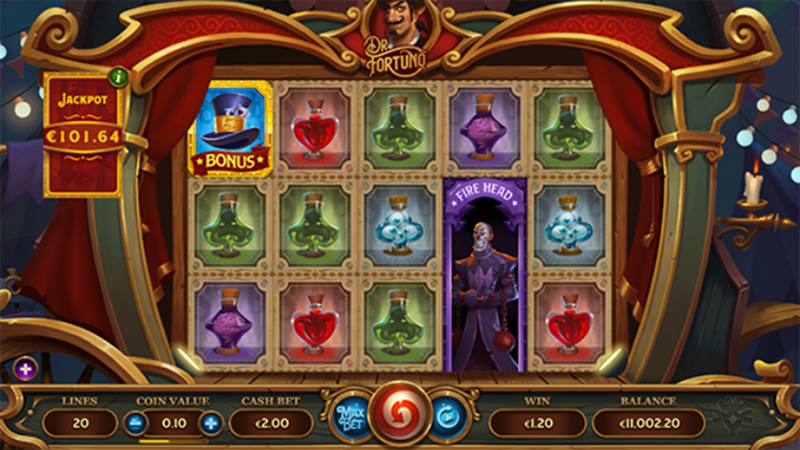 When 3 or more bonus icons appear anywhere on the reels, lucky winners will activate the Dr Fortuno Free Spins feature. Each new round starts with a new raffle where you will be rewarded with 1 out of many features. The exact amount and performance heavily depend on the number of collected bonus icons, which practically makes every single spin a special and unique game. Speaking of the above-mentioned Wheel of Fortuno, this is Dr Fortuno Bonus feature working like a familiar wheel of fortune packed with Multipliers, Jackpots, and cash prizes. Finally, Nudging Wilds should also replace all other items but the Scatter aka bonus icon and help you form a winning combination also improving the payline. Once landed on the reels, they expand and cover a 1×2 base or simply shape up an entire reel. Mobile compatibility is ensured by default, so you will be able to play online using any mobile device on various Yggdrasil -powered sites because there is no need to download the iPhone app or the Android .apk file. Stay tuned for details regarding RTP, tips and other interesting aspects of this promising title that will be closely elaborated in the Dr Fortuno slot review. Want to see how Dr Fortuno works? Select a recommended casino site from the list below and start playing for free or real – our screenshots will give you a sneak peek!